Some rabbits may live in a house without require rabbit cages and live well together with their owner. However, at most cases you may need a cage for your rabbit whether it’s an indoor cage or an outdoor hutch. At least it can be a home for your rabbit. A pet rabbit need a cage as a base camp to get food, water, play, rest and sleep. Also for protection from unfriendly weather, predators and hide from something frightening him. How big is an ideal cage for a rabbit? It depends on the rabbit size (and the space you have for him). Take 3 to 4 times of rabbit’s body length as a minimum cage size (length) to give moving space for the rabbit. And high enough to allow the rabbit stands on his back legs. The door should be wide enough for the rabbit in and out of the cage, also to put feeder, waterer, litter box, and other cage accessories. There are many kind of models and styles of rabbit cages you can find in pet shops. Normally they are made from combination of metal, wood, bamboo, wire and plastic. 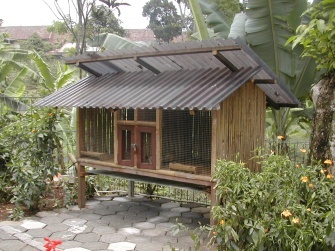 An outdoor duplex rabbit hutch in tropical country, the wall and the floor are made of bamboo. Wire floor is easy for cleaning purpose however it can be tiring for your rabbit. While solid floor is friendly to rabbit paws but may cause the cage easily wet and dirty, unless your rabbit is litter trained. Better alternative is to have wire floor and provide solid mat – not soul mate :) – in part of the floor allowing resting for rabbit legs. Other choice is to look for a cage with wooden or bamboo floor, which usually has half or inch gap between its strips. If you are not satisfy with buying a rabbit cage, or you could not find the one you like, you may consider to build your own. Of course you need a good plan before you build one. Try to think as if we are the rabbit, what they like and what they don’t like should become our main consideration. Once the overall plan is defined, it’s time for execution. To kick off the mind, get some ideas from some cage models available in pet shops or from pictures on internet, and make your own cage style and design, and build from there. What Kind of Rabbit Cage/Hutch do You Have? What kind of rabbit cage/hutch do you provide for your rabbit? You just bought it in a pet shop or made it yourself? Tell us what does it looks like and send us the picture! Your description will appear on a Web page exactly the way you enter it here. You can wrap a word in square brackets to make it appear bold. For example [my cage] would show as my cage on the Web page. Tip: Since most people scan Web pages, include the most interesting about the cage in your first paragraph. Two separated layers easy pull out tray rabbit friendly wires. My rabbit lives free in my bedroom.